Say hello to Jeremy. 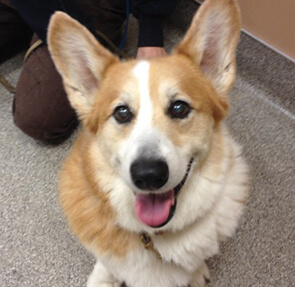 Jeremy is a 12 year old, neutered male Corgi that was recently boarding with us when one of our boarding staff noticed that he looked bloated. It was quickly brought it to the attention of one of our veterinarians who quickly suspected that Jeremy was suffering from bloat, also know as gastric dilatation/volvulus (GDV). GDV, or bloat, is a condition in which the stomach twists on itself and gas quickly accumulates within the stomach. Dogs will often wretch and try to vomit without producing anything and on abdominal palpation it feels like he swallowed a basketball. 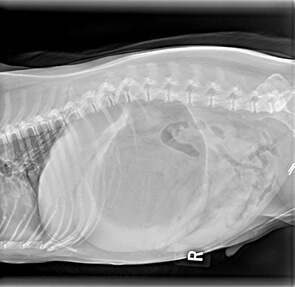 X-rays confirmed that Jeremy had bloated (noticed the large stomach on the x-ray above). A stomach tube was passed to help remove the gas and then Jeremy was taken to surgery. His stomach was de-rotated and then a gastropexy was performed. A gastropexy is a procedure where the stomach is sutured in place to prevent future rotations. Jeremy recovered from his ordeal and is doing well. Congratulations Jeremy on being this Month’s Pet of the Month.